It is almost Valentines day and all the New York stores and restaurants are wanting to make it special for you, knowing that all of us are expected to spend $18.2 billion this year on Valentine’s Day, according to the National Retail Federation and Prosper Insights and Analytics. So we really needs these New York freebies and deals. As usual, White Castle and Waffle House are accepting reservations for special red tablecloths and champagne sit-down service on February 14. If what you and your significant other share is a love of frugality, the holiday is a fine time to find discounts and deals on meals out. Or heart-shaped pizzas. A whole bevy of other chains are offering free and cheap food deals right now, whether specifically linked to V-Day or not. Auntie Anne’s: Download the chain’s My Pretzel Perks app and get a buy one, get one free heart-shaped pretzel in original or cinnamon sugar. Buca di Beppo: Get a heart-shaped lasagna for three people, salad, garlic bread and three cannoli for $49.99. Chili’s: Dinner for two is $20. Enjoy an appetizer and two entrees. 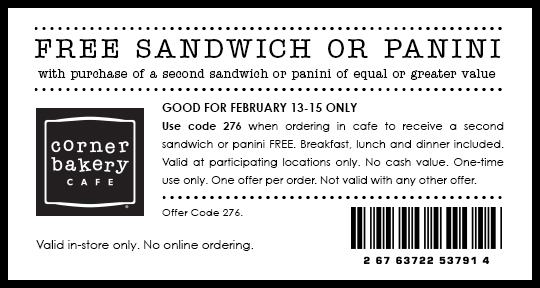 Corner Bakery: Buy one panini or sandwich and get one free at Corner Bakery with this coupon. Valid Feb. 14 and 15. 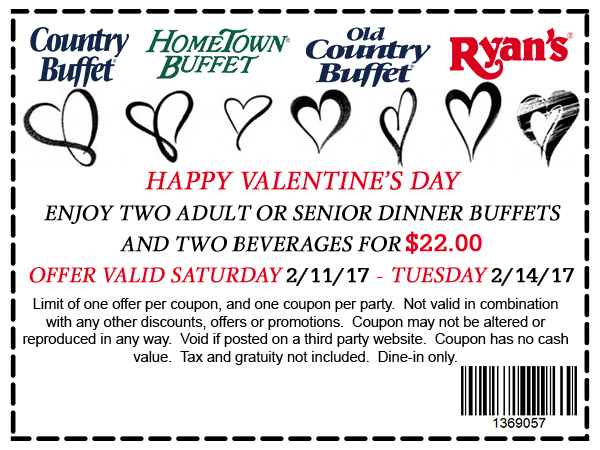 Country Buffet: Get two adult buffets and two drinks for $22 with this coupon. Offer ends Feb. 14. Domino’s: Carry out a large two-topping pizza for $5.99 through Feb. 19. Dunkin’ Donuts: They have heart-shaped donuts, as well as an Instagram-based contest where people are encouraged to share their love stories that involve Dunkin’ Donuts, and we are fairly certain they have to describe the love between two people, not a person and a donut. El Fenix has a sweet and free promo for Valentine’s Day. Guest will receive a Heart-Shaped Sopapillas with the purchase of any entrée. One per guest, valid only on February 14. Fogo de Chao: Eat at Fogo de Chao on Valentine’s Day for a free lunch or dinner gift card to use on your next visit. Hooters: Bring a picture of your ex to Hooters, shred it and you’ll get 10 wings for free when you buy 10 wings on Feb. 14. Boneless wings only. Dine-in only. Krispy Kreme: Buy any coffee and get a free original glazed doughnut. Offer valid until Feb. 28 Participating stores only. That means call before you go. Lone Star Steakhouse: The steakhouse is offering a two for $20 deal, including appetizer, two salads and two entrees. 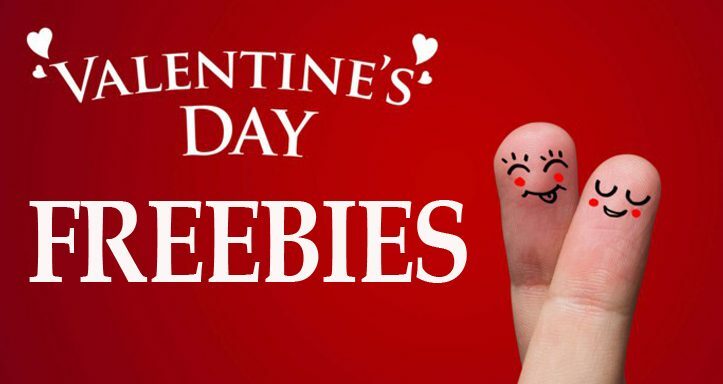 McAlister’s: McAlister’s Valentine’s Day kids eat free special will be available at participating McAlister’s locations on Tuesday, February 14 only, for up to two children aged 12 and under with the purchase of an adult dine-in entrée. Mimi’s Cafe: Get a free entrée on your next visit after leaving a note for someone you love on the chain’s Facebook page. There’s also a deal where couples can get a three-course meal for free if they get engaged at Mimi’s on Valentine’s Day, if they have the ring on hand. Morton’s Steakhouse: Order steak and cold-water lobster for $56 through Tuesday. Peet’s Coffee: Buy one handcrafted beverage and get one free on Valentine’s Day with this coupon. Pizza: Papa John’s, Papa Murphy’s, Pizza Hut, and Valentino’s: All of these chains are reportedly offering heart-shaped pizzas this year; check with your local restaurant to make sure they’re taking part first. Local pizzerias or your favorite regional chains might be taking part as well, but prepare for disappointment. Qdoba: Qdoba is once again offering a BOGO on Valentine’s Day. Buy one entree, and get one free when you share a kiss with anyone or anything ― “even a cell phone,” as a press release states. Schlotzsky’s: The chain is giving away free 3-ounce bottles of its signature hot sauce at restaurants nationwide on Valentine’s Day. No purchase necessary. Shake Shack: Download and order from the Shake Shack app for a free burger, through Feb. 28. Shoney’s: The chain is offering a “2 for $24.99” couples deal for its special food bar. Singles eat for $12.99. All guests who purchase the food bar get a free hot fudge cake. Steak n’ Shake: Get a special Valentine’s Day-inspired milkshake from Steak n’ Shake for $3.69. Flavors include red velvet, Oreo red velvet and chocolate-covered strawberry. TGI Friday’s: Get two entrees and a dessert for $30, plus half off bottles of wine. Waffle House: Reserve a seat at Waffle House and enjoy dinner by candle light. Which Wich: On Valentine’s Day, get a free cookie when you buy a wich and draw a heart on your bag. Feb. 14 only at participating locations. Valid in-store only. MinuteClinic, the retail medical clinic of CVS Health, is offering free “Know Your Numbers” heart-health screenings at its more than 1,100 locations nationwide on Valentine’s Day. Men and women can visit their local MinuteClinic from 10 a.m. to 1 p.m. on Tuesday, February 14 and receive a free heart-health preventative screening.